For close to 20 years POSIES has learned when it comes to making your hot rod ride like a luxury car, Dynamat does the job. Dynamat makes cars feel solid – doors and trunks shut without sounding like a tin can, rain and wind noise virtually disappear and your interior becomes a quiet, comfortable cruising environment. Use Dynamat Xtreme on the interior sheet metal of your vehicle to stop vibration and reduce road noise. Add thermo acoustic liners- such as Dynaliner or DynaPad to fight heat and low frequency hums from big engines and exhaust systems – and you’ve got the ultimate ride. Great for daily drivers, RVs and tow vehicles! Dynamat is the ultimate auto accessory. Exclusive to POSIES are Cool and Quiet kits. These kits are pre-packaged, with the recommended quantity of Dynamat Xtreme and Dynaliner for your particuliar vehicle. The Dynamat difference is explained by Chris Bennett at the NEC Classic car show in Birmingham, England. Have you ever wondered the difference that Dynamat products can make to your restoration or classic car? We explain the sonic and thermal benefits of installing Dynamat first and Dynaliner second. Click banner below for more information on POSIES Cool & Quiet kits. Information Sheet Stop Vibrating Sheet Metal & Road Noise! Use Dynamat Xtreme and make a good street rod a great street rod. Dynamat Xtreme is effective at eliminating high frequency nosies. 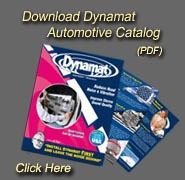 Dynamat should be used on any and all interior sheet metal of your vehicle. Xtreme decreases road noise so you don’t have to turn up the radio to hear the music while reducing fatigue making longer trips more tolerable. Use it on floors, firewalls, roofs, doors and trunk area for a quiet ride. NOTE: Maximum control when applied over Dynamat Xtreme. DynaPad is a four-layer composite barrier that provides excellent acoustic attenuation and thermal insulation. This heavier material utilizes “Dissimilar Layer Insulating” technology that solves two of the most difficult automotive problems – exhaust system heat and low frequency noise. NOTE: DynaPad is used primarily on the floor. Maximum control when applied over Dynamat Xtreme. This durable carpet replacement is made of high grade 3/8” waterproof liner utilizing a 1lb/sq.ft. vinyl barrier over a 1/4” high efficiency thermoacoustic foam. Has a durable deep twist embossed vinyl grain top facing. Available Sizes: 3ft, 6ft, 9ft, 12ft & 25ft x 54” wide. Non-adhesive. Professional tool for applying Dynamat products ensuring proper adhesion with professional-looking results. Hard wood handle and solid high grade rubber roller for years of service. Every employee at POSIES has one in their toolbox! NOTE: Dynamat Xtreme is best applied using a heat gun to help the material become plyable. Once heat is applied you can use the roller to “push” the material onto the sheet metal. Expecially useful for corners and radius pieces.